Ranolazine is indicated for the treatment of chronic angina. Ranolazine may be used with beta-blockers, nitrates, calcium channel blockers, anti-platelet therapy, lipid-lowering therapy, ACE inhibitors, and angiotensin receptor blockers. It has been shown to decrease angina episodes in patients with coronary artery disease on maximal doses of amlodipine. Because Ranolazine prolongs the QT interval, it should be reserved for patients who have not achieved an adequate response with other antianginal drugs.The effect on angina rate or exercise tolerance appeared to be smaller in women than men. Initiate Ranolazine dosing at 500 mg twice daily and increase to 1 gm twice daily, as needed, based on clinical symptoms. Take Ranolazine with or without meals. Ranolazine tablets whole; do not crush, break, or chew. The maximum recommended daily dose of Ranolazine is 1 gm twice daily. If a dose of Ranolazine is missed, take the prescribed dose at the next scheduled time; do not double the next dose. 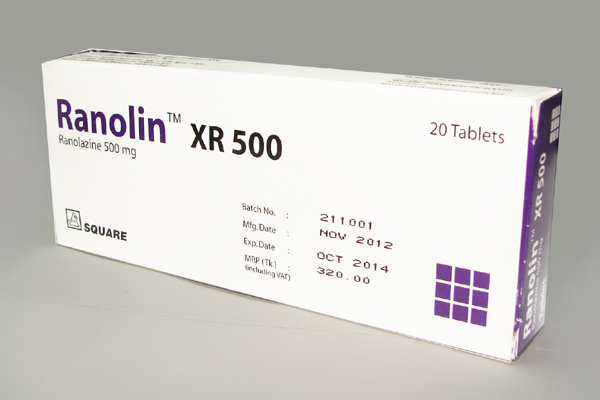 RanolinTM XR 500 tablet: Each box containing 20 extended release tablets in Alu-PVC blister pack.